Preflight preparations should ensure that the GPS is properly installed and certified with a current database for the type of operation. The GPS operation must be conducted in accordance with the FAA-approved POH/AFM or flight manual supplement. Flightcrew members must be thoroughly familiar with the particular GPS equipment installed in the aircraft, the receiver operation manual, and the POH/AFM or flight manual supplement. Unlike ILS and VOR, the basic operation, receiver presentation to the pilot and some capabilities of the equipment can vary greatly. Due to these differences, operation of different brands or even models of the same brand of GPS receiver under IFR should not be attempted without thorough study of the operation of that particular receiver and installation. Using the equipment in flight under VFR conditions prior to attempting IFR operation allows for further familiarization. Required preflight preparations should include checking NOTAMs relating to the IFR flight when using GPS as a supplemental method of navigation. GPS satellite outages are issued as GPS NOTAMs both domestically and internationally. Pilots may obtain GPS RAIM availability information for an airport by specifically requesting GPS aeronautical information from an FSS during preflight briefings. GPS RAIM aeronautical information can be obtained for a 3-hour period: the estimated time of arrival (ETA), and 1 hour before to 1 hour after the ETA hour, or a 24-hour time frame for a specific airport. FAA briefers provide RAIM information for a period of 1 hour before to 1 hour after the ETA, unless a specific timeframe is requested by the pilot. If flying a published GPS departure, the pilot should also request a RAIM prediction for the departure airport. Some GPS receivers have the capability to predict RAIM availability. The pilot should also ensure that the required underlying ground-based navigation facilities and related aircraft equipment appropriate to the route of flight, terminal operations, instrument approaches for the destination, and alternate airports/heliports are operational for the ETA. If the required ground-based facilities and equipment are not available, the flight should be rerouted, rescheduled, canceled, or conducted under VFR. Except for programming and retrieving information from the GPS receiver, planning the flight is accomplished in a similar manner to conventional NAVAIDs. Departure WP, DP, route, STAR, desired approach, IAF, and destination airport are entered into the GPS receiver according to the manufacturer’s instructions. During preflight, additional information may be entered for functions such as ETA, fuel planning, winds aloft, etc. When the GPS receiver is turned on, it begins an internal process of test and initialization. When the receiver is initialized, the user develops the route by selecting a WP or series of WPs, verifies the data, and selects the active flight plan. This procedure varies widely among receivers made by different manufacturers. GPS is a complex system, offering little standardization between receiver models. It is the pilot’s responsibility to be familiar with the operation of the equipment in the aircraft. The GPS receiver provides navigational values such as track, bearing, groundspeed, and distance. These are computed from the aircraft’s present latitude and longitude to the location of the next WP. Course guidance is provided between WPs. The pilot has the advantage of knowing the aircraft’s actual track over the ground. As long as track and bearing to the WP are matched up (by selecting the correct aircraft heading), the aircraft is going directly to the WP. There is a mixture of GPS overlay approaches (approaches with “or GPS” in the title) and GPS stand-alone approaches in the United States. NOTE: GPS instrument approach operations outside the United States must be authorized by the appropriate country authority. While conducting these IAPs, ground-based NAVAIDs are not required to be operational and associated aircraft avionics need not be installed, operational, turned on, or monitored; however, monitoring backup navigation systems is always recommended when available. All IAPs must be retrievable from the current GPS database supplied by the manufacturer or other FAA-approved source. Flying point to point on the approach does not assure compliance with the published approach procedure. The proper RAIM sensitivity is not available and the CDI sensitivity does not automatically change to 0.3 NM. Manually setting CDI sensitivity does not automatically change the RAIM sensitivity on some receivers. Some existing nonprecision approach procedures cannot be coded for use with GPS and are not available as overlays. GPS approaches are requested and approved by ATC using the GPS title, such as “GPS RWY 24” or “RNAV RWY 35.” Using the manufacturer’s recommended procedures, the desired approach and the appropriate IAF are selected from the GPS receiver database. Pilots should fly the full approach from an initial approach waypoint (IAWP) or feeder fix unless specifically cleared otherwise. Randomly joining an approach at an intermediate fix does not ensure terrain clearance. When an approach has been loaded in the flight plan, GPS receivers give an “arm” annunciation 30 NM straight line distance from the airport/heliport reference point. The approach mode should be “armed” when within 30 NM distance so the receiver changes from en route CDI (±5 NM) and RAIM (±2 NM) sensitivity to ±1 NM terminal sensitivity. Where the IAWP is within 30 NM, a CDI sensitivity change occurs once the approach mode is armed and the aircraft is within 30 NM. Where the IAWP is beyond the 30 NM point, CDI sensitivity does not change until the aircraft is within 30 NM even if the approach is armed earlier. Feeder route obstacle clearance is predicated on the receiver CDI and RAIM being in terminal CDI sensitivity within 30 NM of the airport/heliport reference point; therefore, the receiver should always be armed no later than the 30 NM annunciation. Pilots should pay particular attention to the exact operation of their GPS receivers for performing holding patterns and in the case of overlay approaches, operations such as procedure turns. These procedures may require manual intervention by the pilot to stop the sequencing of WPs by the receiver and to resume automatic GPS navigation sequencing once the maneuver is complete. The same WP may appear in the route of flight more than once and consecutively (e.g., IAWP, final approach waypoint (FAWP), missed approach waypoint (MAWP) on a procedure turn). Care must be exercised to ensure the receiver is sequenced to the appropriate WP for the segment of the procedure being flown, especially if one or more fly-over WPs are skipped (e.g., FAWP rather than IAWP if the procedure turn is not flown). The pilot may need to sequence past one or more fly-overs of the same WP in order to start GPS automatic sequencing at the proper place in the sequence of WPs. When receiving vectors to final, most receiver operating manuals suggest placing the receiver in the nonsequencing mode on the FAWP and manually setting the course. This provides an extended final approach course in cases where the aircraft is vectored onto the final approach course outside of any existing segment that is aligned with the runway. Assigned altitudes must be maintained until established on a published segment of the approach. Required altitudes at WPs outside the FAWP or step-down fixes must be considered. Calculating the distance to the FAWP may be required in order to descend at the proper location. When within 2 NM of the FAWP with the approach mode armed, the approach mode switches to active, which results in RAIM and CDI sensitivity changing to the approach mode. Beginning 2 NM prior to the FAWP, the full scale CDI sensitivity changes smoothly from ±1 NM to ±0.3 NM at the FAWP. As sensitivity changes from ±1 NM to ±0.3 NM approaching the FAWP, and the CDI not centered, the corresponding increase in CDI displacement may give the impression the aircraft is moving further away from the intended course even though it is on an acceptable intercept heading. 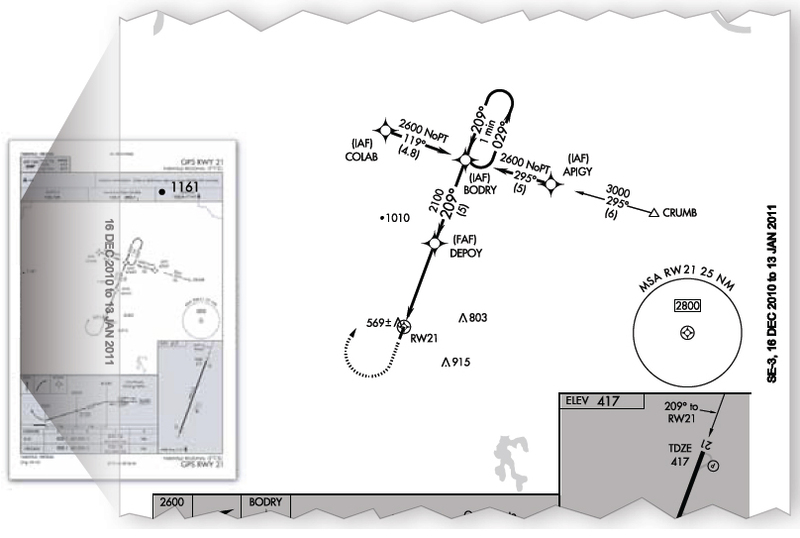 If digital track displacement information (cross-track error) is available in the approach mode, it may help the pilot remain position oriented in this situation. Being established on the final approach course prior to the beginning of the sensitivity change at 2 NM helps prevent problems in interpreting the CDI display during ramp-down. Requesting or accepting vectors, which causes the aircraft to intercept the final approach course within 2 NM of the FAWP, is not recommended. Incorrect inputs into the GPS receiver are especially critical during approaches. In some cases, an incorrect entry can cause the receiver to leave the approach mode. Overriding an automatically selected sensitivity during an approach cancels the approach mode annunciation. If the approach mode is not armed by 2 NM prior to the FAWP, the approach mode does not become active at 2 NM prior to the FAWP and the equipment will flag. In these conditions, the RAIM and CDI sensitivity do not ramp down, and the pilot should not descend to minimum descent altitude (MDA) but fly to the MAWP and execute a missed approach. The approach active annunciator and/or the receiver should be checked to ensure the approach mode is active prior to the FAWP. A GPS missed approach requires pilot action to sequence the receiver past the MAWP to the missed approach portion of the procedure. The pilot must be thoroughly familiar with the activation procedure for the particular GPS receiver installed in the aircraft and must initiate appropriate action after the MAWP. Activating the missed approach prior to the MAWP causes CDI sensitivity to change immediately to terminal (±1 NM) sensitivity, and the receiver continues to navigate to the MAWP. The receiver does not sequence past the MAWP. Turns should not begin prior to the MAWP. If the missed approach is not activated, the GPS receiver displays an extension of the inbound final approach course and the along track distance (ATD) increases from the MAWP until it is manually sequenced after crossing the MAWP. Missed approach routings in which the first track is via a course rather than direct to the next WP require additional action by the pilot to set the course. Being familiar with all of the required inputs is especially critical during this phase of flight.